I am going to leave the hot takes to the professionals, updating this post with links to content I find compelling. Will every perspective be represented? No. Do I endorse every finding? No. Do I think all of these are worth a read? Absolutely. Many of my links emphasize the media’s (and the white-led political establishment’s (though that can include Black officials like Mayor Stephanie Rawlings-Blake, as Brittney Cooper notes)) enthusiasm for separating respectable and non-respectable modes of protest and being-in-public. When nonviolence begins halfway through the war with the aggressor calling time out, it exposes itself as a ruse. When nonviolence is preached by the representatives of the state, while the state doles out heaps of violence to its citizens, it reveals itself to be a con. This is an old trope, one in which the American media demands that any non-hegemonic group leaders — from any racial or gender or social minority — condemn the actions of any hammershit fool who does anything ugly while existing within their demographic. This is often the initial engagement of any minority, regarding any minority action, regardless of the merits of that minority action. Thank you for being on our show, and we’ll get to your concerns in a moment, but first, apologize and explain yourself. Like the old political line, “If you’re explaining, you’re losing.” By the time they’re done defending their mere existence, there’s no time left for their points. You can silence any problem by running out the clock. But maybe this is all rather abstract, so let’s make fun of Wolf Blitzer. It’s worth mentioning that if a category of alleged police abuse–driving unbelted suspects around sharp corners and through sudden stops in the back of a police wagon–has a name that is known among non-cops, and if that category of alleged police abuse has a name that dates it to the days when a roller coaster cost a nickel to ride, it’s most definitely a real thing. Credit where it’s due, Conor Friedersdorf has taken an honest look from right-of-center and identified police lawlessness as a significant cause of Baltimore’s problems. I think he still confuses causes and effects, but I’ll credit any conservative condemnation of police lawlessness wherever I find it. And, as the 50th Anniversary of the Watts uprising approaches (as well as the 50th of the Moynihan Report), we can reflect on what has changed and what has not. We haven’t received any information about what happened to [Freddie Gray]. It seemed like he was harmed…We can’t talk to the police. The news keeps showing how he was dragged to the paddywagon…as a mother, that was just devastating to see. There’s plenty more, if you can stand it. I wonder if these white kids flagrantly breaking the liquor laws need someone like Toya Graham to start smacking them around. Would Rand Paul agree to that? 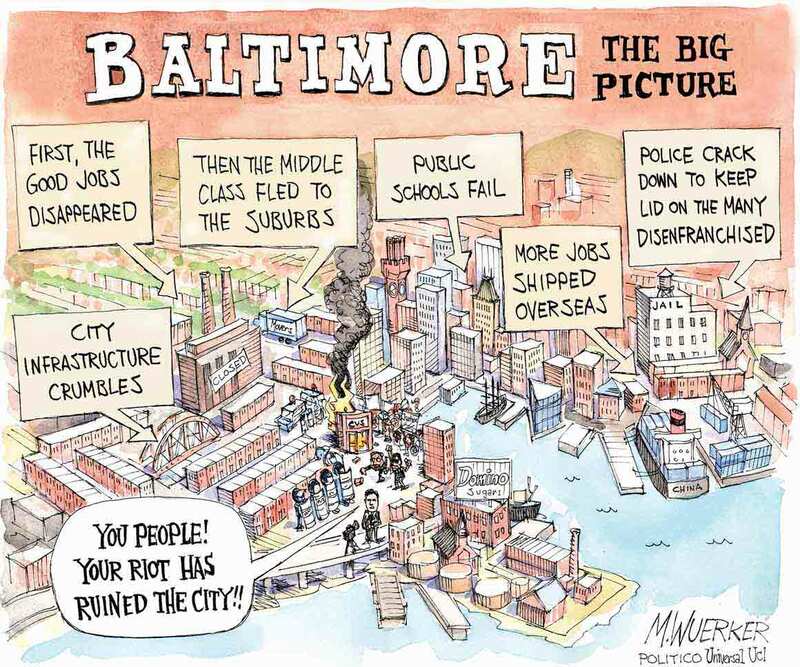 BALTIMORE—Calling it an emergency measure designed to ensure public safety and order, Baltimore officials held a press conference Wednesday urging all residents to stay indoors until the natural evolution of social progress takes shape over the next century. The funniest part of the joke is that that’s our actual policy for racial justice and reconciliation! Today, we have more black elected officials in the United States than at any point in American history. Yet for the vast majority of black people, life has changed very little. Black elected officials have largely governed in the same way as their white counterparts, reflecting all of the racism, corruption, and policies favoring the wealthy seen throughout mainstream politics…. Black political operatives operate in the same terrain as their white competitors. They compete to stay in the good graces of wealthy donors while maximizing political connections to bolster their campaign war chests. They, too, rely on aggressive policing to make up for the social problems created when poverty, gutted social services, and no prospects for success in American society converge and eventually combust. The uprising in Baltimore has crystalized the deepening political and class divide in black America. This is a new development in the black freedom struggle that historically has been united across class lines to fight racism. Also worth checking out: this piece in the Guardian, in which geographer Ruthie Gilmore discusses the political economy of mass incarceration and urban austerity. Although I know Gilmore would be mildly horrified by the reporter’s implication that she’s an intellectual descendant of W.J. Wilson, it is a good distillation of her discussion of racism in terms of differential vulnerability to premature death. And, while I am a huge fan of The Wire, Dave Zirin raises a couple of important critiques of the show that bear on whether the show’s fans get what’s going on in places like Baltimore. I am now seeing what the The Wire was missing, despite its much lauded, painstaking verisimilitude: the voices of people organizing together for change. Everyone on The Wire seeks individual solutions for social problems: the lone cop, the lone criminal, the lone teacher, the lone newspaper reporter. Yes, it is certainly true that when entrenched bureaucracies battle individuals, individuals lose. But when bureaucracies battle social movements, the results can be quite different. I think Zirin’s right here. One thing that David Simon nailed in the show was the way that the dysfunction of public and public-serving follows from a politics of austerity and disinvestment. But, perhaps because the series’s essential structure as a cop show demands individual narrative arcs, there are no social movements challenging those institutions to change. It’s always cringe-worthy when a wealthy middle-aged white guy lectures young black people about who they are and what they should do. In other words, if you had said two weeks ago—in the battle of prominent Baltimore Caucasians—that Orioles Manager Buck Showalter would represent himself better than David Simon, I think many would have been surprised.